Now that I had created a vehicle that was capable of transporting the driver and possibly a fool hardy passenger to the edge of sanity within seconds - all while staying under the posted speed limit of course! - I definitely felt a need for dependable rollover protection. Searching suppliers for a ready-made product produced tall boxy looking (though SCCA approved) structures that are far from complementary to the timeless styling of the MGB! An additional version was located that was one step closer to conforming to the shape of the seats, yet sported two over sized hoops so as to appear generic in design. (4) retain use of the convertible top. Taking a sketch of my initial design concept to a local race/show car builder, I was promptly presented with an estimate of $2,750.00! And I was further told the desired tubing could not be bent in a small enough shape to "shadow" the profile of the seats! While still trying to accept defeat, I happened upon a bicycle rack at a local school that to me appeared to encompass the shapes, bends and even the size of tubing that could possibly be reconfigured into a roll bar for the MGB! I wasted no time contacting the manufacturer. Their name plate was attached to the bike rack: www.DuMor.com and I was told that I'd have to go through one of their dealers. While questioning the purpose of the inquiry, they readily provide me with the name of a dealer in my area. With that, a powder-coated "five bike" version was purchased. (I don't recommend the galvanized steel version because welding galvanized steel creates very toxic fumes.) The bike rack was soon delivered by an eighteen wheel freight delivery truck to my home shop and I was on my way! The steel pipe used in the construction of the DuMor bike rack is 2 3/8" outside diameter with a 5/16" wall thickness. While I wanted my roll hoops to conform to the shape of my seats - resembling those available for Miata or BMW roadsters - they could easily be constructed taller. This photo illustrates how the "hoops" and necessary braces were all cut from the original product. 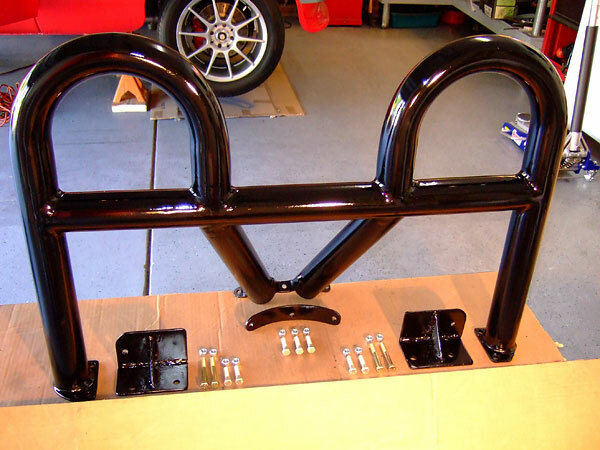 This view shows the parts being extracted from the original bike rack to begin morphing into a roll bar. This shot shows the pieces being prepared for welding together. A "tube notching" tool is very helpful at this stage to produce strong, smooth joints. 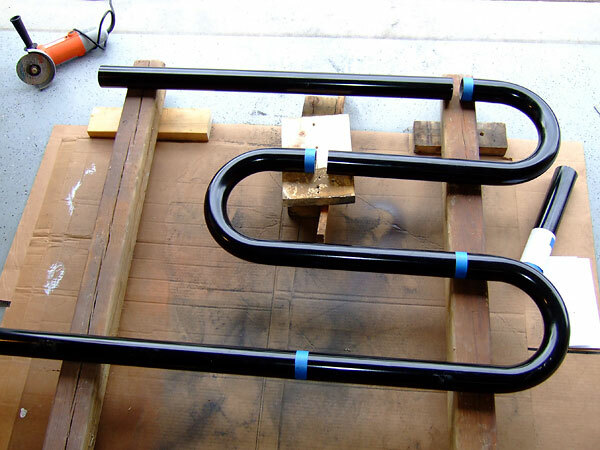 The rack is delivered with a powder coat finish that must be ground away for a strong weld. However, the manufacturer does include a can of paint for touching up the welds if desired. The bike rack turned roll hoop is now trial-fitted into the vehicle to insure proper positioning of the mounting points while ensuring access to the battery compartment has been retained. 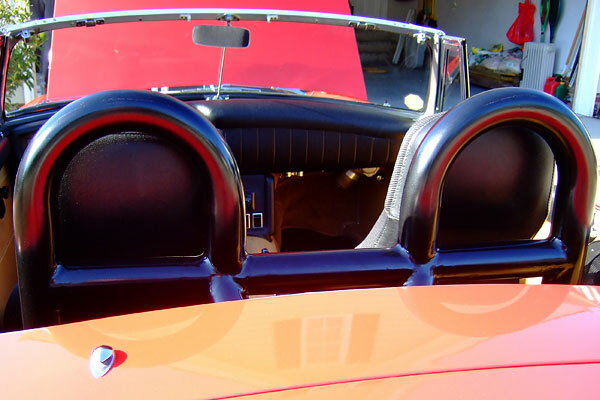 The convertible top was also installed at this step to be sure the top could still be utilized without any alterations. This is a view of the inside floor mounting brackets. 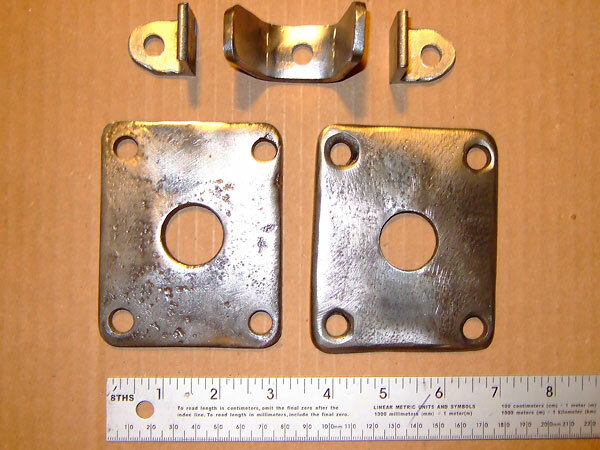 A sharp eye might see that the two large rectangular floor mounting plates were actually the lower plates that at one time were used in securing the rear leaf springs to the axle housing. The three small brackets are to be welded to the two rear support braces, which will connect the two braces and then secure the assembly to the differential hump in the floor. 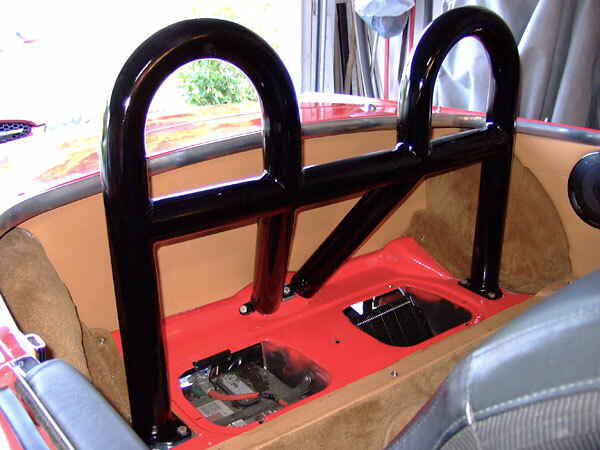 This photo shows the layout of the roll bar with the inside floor brackets mounted. The remaining three brackets shown are used in supporting the strengthening of the three mounting points. The two larger brackets bolt underside to the frame, using the mounting holes from the original shock absorbers that were removed in favor of modern air assist shocks. 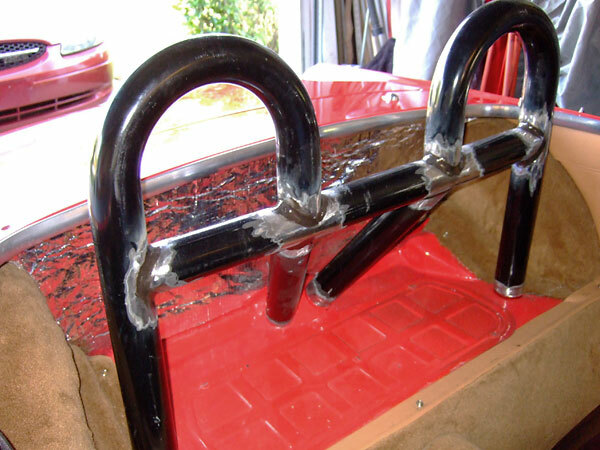 After the placement was once more confirmed, the roll bar assembly was secured to the floor and frame using the underside reinforcement brackets joined using course thread SAE Grade 8 bolts. Once the assembly is mounted, it not only results in roll over protection for the occupants but forms a strong, integral cross bracing that supplements the vehicle's unibody. The carpet covering the access cover is then partially snapped into place before cutting holes for the three mounting points. Extreme caution should be exercised at this stage to avoid replacing a section of the carpet! Using a sharp cutting tool (box cutter, carpet knife, etc. ), begin by cutting a hole about one-fourth the size of the roll bar tubing. Then, gradually enlarge the hole while doing any minor repositioning as necessary until the carpet fits snuggly and wrinkle-free around the tubing. 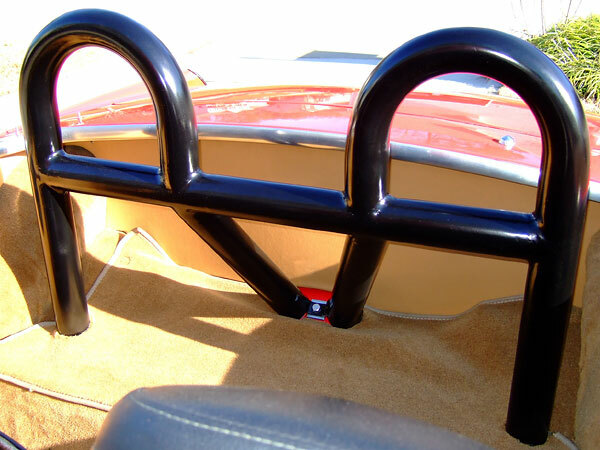 The photo at the very top of this article shows how the cross brace aligns with the level of the body while forming a "shadow contour" of the head rest of the Mazda Miata bucket seat. The height of the hoops are of course a personal preference, and can be altered in step one when cutting out the individual hoops from the bike rack. (Race sanctioning organizations require taller roll hoops to accommodate helmet-wearing heads. If your car's seats don't have integral headrests, your roll hoop will obviously require padding.) While no rollover hoop provides absolute protection in the event of a vehicle roll over, the bicycle-rack roll hoop is cost efficient, very robust, and stylish too! Readers who aspire to road race their sports cars would be well advised to check club rules before constructing or fitting any sort of rollover protection. As Don noted in the very first paragraph of his article, roll hoops constructed to meet Sports Car Club of America rules tend to be "tall boxy looking structures that are far from complementary to the timeless styling of the MGB." They actually differ in more ways than just height or shape. It might be instructive to look briefly at the SCCA rules. First of all, SCCA is rather specific about tubing: they require seamless or DOM (drawn over mandrel) tubing. 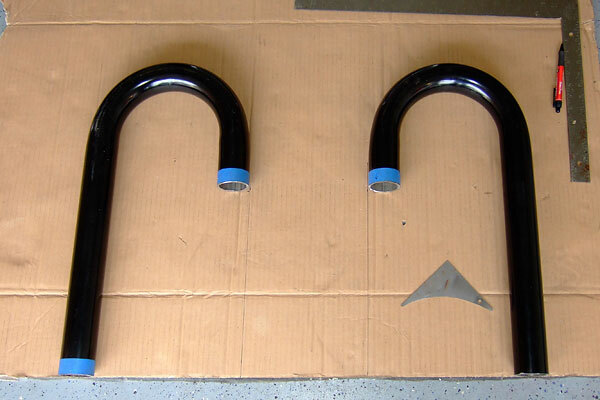 DuMor bicycle racks are made from Schedule 40 steel pipe, which has a longitudinal welded seam. Furthermore, SCCA gives roll hoop fabricators a choice between mild steel (specifically SAE 1010, 1020, or 1025 alloys) or Chrome-Moly alloy steel (specifically SAE 4130) tubing. The steel used in Schedule 40 pipe may or may not equate to one of SCCA's explicitly specified mild steel options; but it very likely has a higher carbon content. 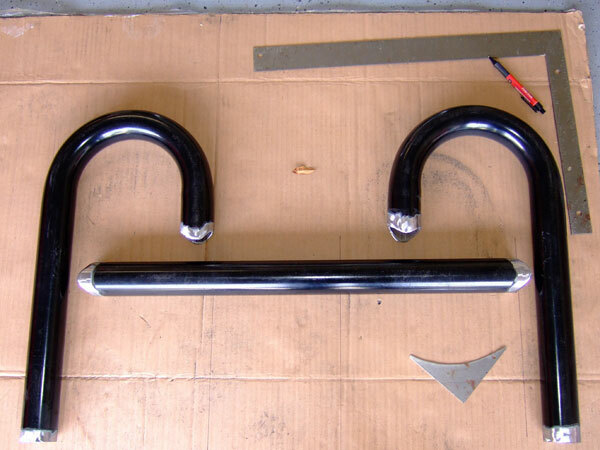 To keep weight down, racers tend to select thin wall tubing. For a production-class racecar weighing between 1500 and 2500 pounds, the minimum size mild steel tubing allowed by SCCA is 1.50" diameter by 0.095" wall thickness. (Chome-Moly steel alloys have a higher tensile strength. If 4130 tubing is used, SCCA allows smaller minimum dimensions: 1.375" diameter by 0.095".) By comparison, with a 2.375" outside diameter and a beefy 0.3125" wall thickness, Don's Schedule 40 roll hoops are huge! At every joint, including especially at mounting brackets, a larger weld area equates to a stronger intersection. Consider the difference in weld length: ~4.712" around the circumference of a 1.5" diameter tube versus ~7.461" around a 2.375" diameter pipe equates to over 58 percent more weld length. (Weld depth may be more too.) In summary, the bicycle-rack roll hoops are made from inferior material but there's much more of it. SCCA's rules are a minimum standard; some racers prefer to go a size larger. For example, by substituting 1.75" diameter tubing for 1.5" diameter tubing they get a much stronger roll cage. In this example, every single welded joint is stronger by at least seventeen percent. Other racer's take a different approach: they buy into the promise of a stronger and lighter roll structure made from Chrome-Moly steel alloy tubing. I'm going to digress to explain my strong opinion that almost everyone should avoid using 4130 for safety-related welded fabrications because generally welds in 4130 require heat treatment. They can reduce but not fully eliminate the need for heat treatment by selecting a filler rod that dilutes the alloy level in the weld zone (e.g. ER70S-2), but doing so reduces tensile and yield strength of the weld substantially. Racers who select Chrome-Moly generally specify a smaller tube diameter to save weight, but with the smaller diameter they get a smaller weld area. Smaller weld area combined with diluted alloy typically produces a weaker joint than if they'd simply used mild steel for the whole assembly. On the other hand, if they select a filler material that doesn't dilute the weld (i.e. a 4130 rod) or one that dilutes it less (e.g. ER80S-D2), heat treatment is critical. If heat treatment is skipped or performed poorly, the resulting structure will be much more likely to brake when impacted than a comparable mild steel structure despite the higher strength rating and very large price premium of Chrome-Moly! There are much more cost-effective ways to make a racecar light and quick - and safer - so amateur racers would be wise to leave Chrome-Moly to professional race teams. For several decades, SCCA roll cage specifications have mandated generous survival space for helmeted racers in the event of rollovers. The idea of roll hoop that follows headrest shape is anathema to their way of thinking: "roll hoops should be wide." In sharp contrast, a key reason Don was attracted to DuMor's bicycle racks as a source of material was the small radius of their bends. The SCCA General Competition Rules are specific: "The radius of bends in the roll cage hoop (measured at centerline of tubing) shall not be less than three (3) times the diameter of the tubing." In the context of a wide main hoop, a tight bend is generally more likely to deform significantly on impact. There are many other rules, for example relating to the placement and geometry of bracing, but it probably wouldn't be productive to list them here. The "take away point" is that there really are significant differences between the roll hoops we generally see on street cars and the roll cages used on race cars. We can learn from the latter, even if we don't choose to emulate them. Disclaimer: The two articles on this page were researched and written by Don Bode and by Curtis Jacobson respectively. Views expressed are those of the respective authors, and are provided without warrantee or guarantee. Apply at your own risk. Photos by Don Bode for BritishV8 Magazine. All rights reserved.